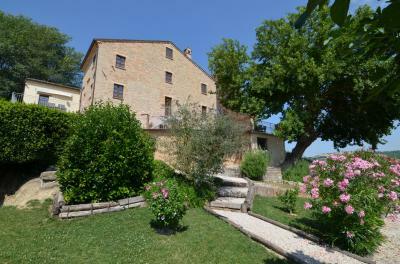 In one of the most beautiful locations of Marche, wonderful restored farmhouse for Sale with swimming pool, annex and agricultural land. 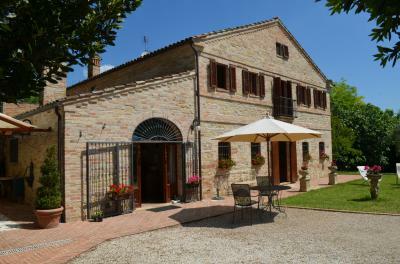 The house is located on top of a hill with a wonderful 360 degrees view that goes from the countryside of San Ginesio until Conero Mountain. Truly amazing. The property consists of a main building made of original stones approximately 260 sqm and an annex for garage/storgae of about 100 sqm (but convertible into a cottage asking a municipal permission). The house was renovated on 2006 and has recently been subject of a structural reinforcement that made it even more safe on anti-seismic level. Definitely a great feature which is not easy to find in other restored houses. The entrance to the house is adorned with a beautiful brick and wooden porch where you can dine or just relax on hot summer days. From the main entrance you reach a large kitchen, a laundry room, bathroom and a wonderful and bright living room with fireplace (Vulcano heating system). The ground floor is equipped with french doors that allow direct access to the garden and then the pool. Through internal stairs it's possible to reach the first floor where there are three double bedrooms (one is very huge with ensuite) and a family bathroom. The second floor is the attic, which has been well restored and is currently used by the owner as "hobby home cinema room, bathroom with tub and shower, toilet and guest bedroom. The garden of the house is really lovely and elegant, rich in flowers and ornaments of all kinds and carefully maintained by the owners. There is also a nice pool size mt 15.00 x 4.00 also suitable for swim. In front of the pool was created also a wooden pergola with BBQ area. The view from this corner is quite breathtaking. Around the garden, the property has more than 4 hectares of farmland currently used by a local neighbour who take care and clean it. If you're looking for a unique property in a great location, with easy access and close to all amenities, this is the right home for you. Discover it and you'll be amazed by its beauty and character.